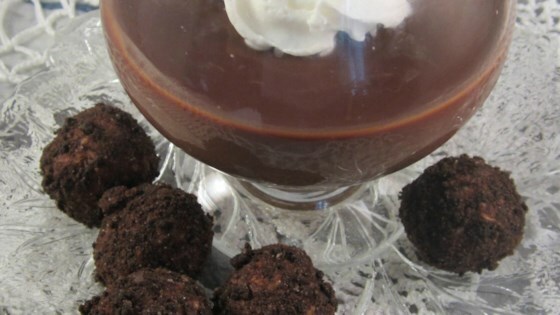 "Soft fudge-like rum balls that the whole family will love!" In the microwave or in a bowl over simmering water, melt chocolate, stirring occasionally until smooth. Process the almonds in a food processor. Transfer to a medium bowl and stir in the cream cheese, confectioners' sugar, instant coffee and rum. Blend in the melted chocolate. If dough is too soft to form balls, chill for 1 hour. Roll dough into 1 inch balls. Roll the balls in the chocolate sprinkles. Store in a covered container in the refrigerator until serving time. I used crushed Chips Ahoy for the topping... Very, Very good.